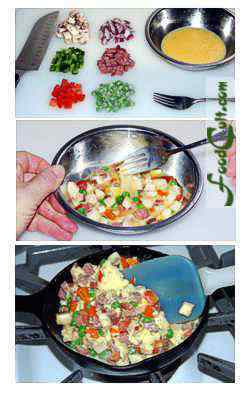 Galganov's Easy Recipe for Great Fillings and Garnishes for Crepes! 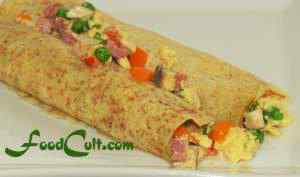 The Best and Easiest in Scrambled Omelet Crepe fillings Recipes! Add water to egg and beat until smooth (avoid frothing the egg - do not over-beat). Dice ingredients to about 1/4" (.7 cm) or a little larger. Stir diced ingredients into egg until well integrated. These added ingredients will overwhelm the egg - and that's fine. Heat your pan on low-medium-low heat (hot enough to cook the egg slowly). Add your choice of fat (ie, butter, margarine or oil) and coat the pan well. Add egg mixture to the pan stirring it regularly so as to break it up into a "scramble" and not let it stick to the pan. Roll a little less than half the ingredients into one crepe. Then repeat with the second crepe - reserving a little filling as garnish. One crepe per plate with a piece of smoked fish and some fresh vegetables and/or fruit (lettuce with tomato slices shown here). Prepare two plates this way to create a satisfying breakfast for two - from a single egg. Two crepes (still only a single egg), a piece of smoked fish and fresh vegetables and/or fruit (lettuce with tomato slices shown here). A big, satisfying breakfast prepared for someone with a busy, active day ahead! This is a wonderful crepe - ideal for breakfast, brunch or a satisfying snack. This preparation delivers a hearty meal from a single egg. This crepe may be served alone or along with something else (as pictured on this page). It is quite wonderful with a piece of fish on the side. It may be served with a bit of fresh fruit ... or any number of ways. While we like to fill this crepe with a little red onion, mushroom, sweet bell pepper (any colour we have handy - they're all quite wonderful), tomato, a few peas (we like to use frozen peas) and just a little salami, you can fill your crepe any way that pleases you. A bit of brocolli can be nice, for example; or spice it up with a little finely diced jalapeno pepper ... or even a bit of diced emental or jarlesbourg (or what ever your favourite cheese may be). This highly adaptable crepe filling can be prepared as a vegetarian delight or you can hash in your favourite breakfast meat. This recipe is a delight with a white crepe or with light, whole wheat crepes. You can always go get some Wallpaper Originals' Free Food Desktop Wallpapers for Mac & PC - now that you've found the web's best and easiest Crépes Fillings and Garnishes Recipe.